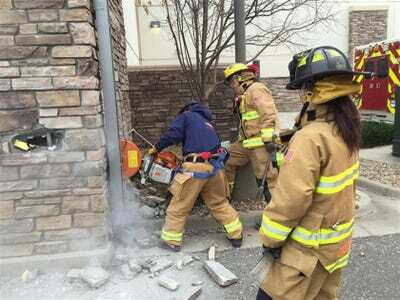 9News Denver/TwitterFirefighters rescue a Colorado man who was trapped for 3 days inside the wall of a department store. A Colorado man was pulled to safety on Tuesday after rescuers cut through the wall of a department store where he had been trapped for three days after plunging from the building’s roof, authorities said. Paul Felyk, 35, was rescued from between the walls of a Marshalls store in Longmont, about 35 miles north of Denver, police spokesman Sergeant Matt Cage said. Felyk sustained injuries to his lower extremities and remains hospitalized where he is also being treated for dehydration, Cage said, adding that he will likely face criminal charges when he recovers. “He has not been arrested, but we’re investigating him for an attempted burglary,” Cage said. Cage said police were called to the store on Monday after workers reported hearing noises around the building. The responding officer did not find anything and police stepped up patrols in the area because it is adjacent to an area frequented by transients. Longmont fire department spokeswoman Molly Meehan said store employees called authorities again on Tuesday to report that they heard a man yelling inside the building, but could not locate the source. “Crews determined the man was stuck between the exterior and interior walls,” she said. Firefighters sawed a hole through an exterior wall to extract Felyk, Meehan said. He had plummeted about 20 feet from a vestibule on the roof sometime over the weekend, police said. Cage said the area where Felyk was trapped was large enough for him to stand up, but that it was dark and temperatures dipped into the single digits overnight. “I believe he spent at least one cold night there,” Cage said.